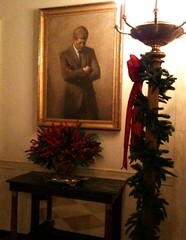 Tuesday afternoon, I spent 2 hours at a holiday reception at 1600 Pennsylvania Avenue. President and Mrs. Obama shared their home and a few thoughts with about 1,000 attendees, many of whom have been involved in health care reform in one way or another. President Obama suggested he may have a HCR bill to sign by Christmas. We are hearing that the Senate has a lot of work to do first. A group of "freshman" senators introduced a series of amendments last week, many of which we support. We will continue to work on shaping language and supporting or opposing amendments as appropriate in a rapidly moving environment. Our goal is to ensure that pharmacists are in a position to address our nation's medication-use crisis in a meaningful way in any reformed health care system that emerges from the HCR debate. Please stay involved at pharmacist.com and with your Senator or Congressman.